If you are a fan of Nickolas Butler's tremendous 2014 novel Shotgun Lovesongs (and if you're not, ummm...what?! 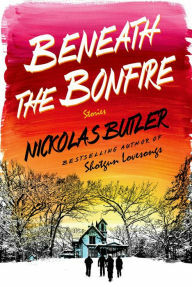 ), you'll love his new short story collection, Beneath The Bonfire. To many, me included, Richard Russo is the undisputed champion of chronicling life in small or failing rural towns. But with these 10 stories set in Wisconsin, Butler does his best to out-Russo Russo. Butler's stories are about ordinary everyday people, and their relationships — bro-mance-friendships, boyfriend/girlfriend, marriage. And Butler is masterful at rendering these relationships authentically and sensitively. He just seems to understand people. "But when you know someone like Sven, you defend him, because you want there to be good people in the world and it doesn't do anyone any good to break them down into something as bad and ugly as everyone else." But it's not just the dudes that get Butler's careful eye. He also renders male/female relationships with insight and accuracy. Perhaps the best story in the collection, though by far the most difficult to read, is "In Western Counties." It's about a woman who has never had much luck with relationships, and falls in love (or at least, infatuation) with a dashing charismatic fellow who turns out to be not only abusive to her, but also an out-and-out criminal. He runs a dogfighting circuit out of the barn of the farmhouse he's stolen from a sweet old lady. The story's about how this woman, in conjunction with a retired State Highway Patrolwoman named Aida try to stop him and get revenge. Trust me when I say the conclusion to this one is satisfying. While many of the relationships in these stories are disasters, the collection ends on such a sweet, hopeful note. The story "Apples" is about an elderly couple who seem to be the ideal of marriage. When the man loses his job, he begins picking apples in an orchard for a rich guy. It's a quiet, funny story that ends on almost a tear-inducingly happy note. Loved it. And I loved this collection overall. Stories range from funny to gut-punch to sensitive and quiet, but all are immensely entertaining — a rarity for a full collection. Very, very highly recommended — the best collection I've read in a long time. I like this article, makes me think about a lot of things. But one thing I like is opening my horizons, I become more intelligent. I don't know why but I've been off short stories for a while and can't seem to find my way back in. I love novels - especially if they're over 500 pages. I want to get lost in long stories. But I also feel like I'm missing out of some good story collections. Like this one. Any suggestions?